← An update on my reviews page! I am now going to review all books and any books! Whangarei, New Zealand! First stop on a wonderful trip. New Zealand. The land of the Long White Cloud. Mountains, snow, waterfalls, bushwalks, wine, food and beauty. So much to see and do yet so little time! And in that little time we had we saw so much yet so little. It was a wonderful trip and we can’t wait to go back and explore more. And now as promised I want to share some stories and photos of this trip with you. Wayne and I spent four weeks traveling around New Zealand, we hired a car and drove around, stopping where we liked, bypassing places that just weren’t what we wanted. We steered clear of most major cities as we enjoy the open roads, fresh air and quiet. We started on the North Island and after two weeks we moved on to the South Island and the contrast of the two islands is amazingly gorgeous! I must say I enjoyed the North Island more but have found through talking to other travellers and friends many seem to like the South Island with all its mountains and adventure. Nothing wrong with that as all of New Zealand is glorious and beautiful, fun and exciting. 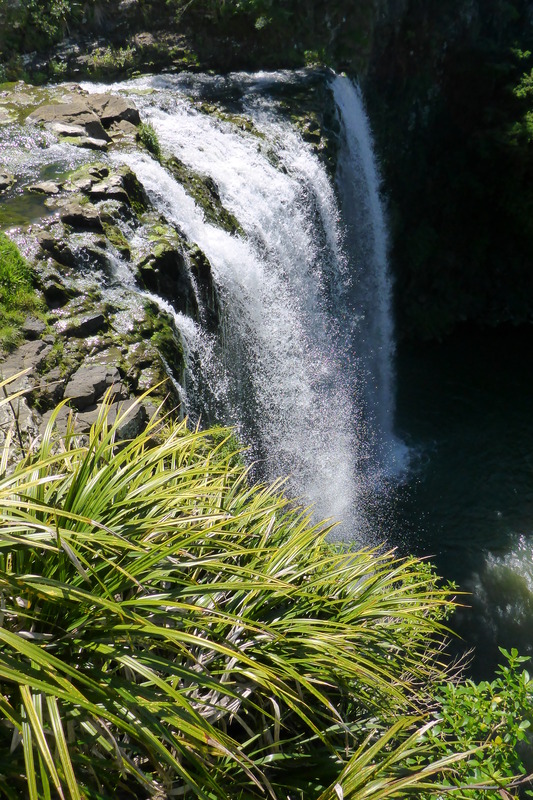 The beauty of Whangarei Falls. 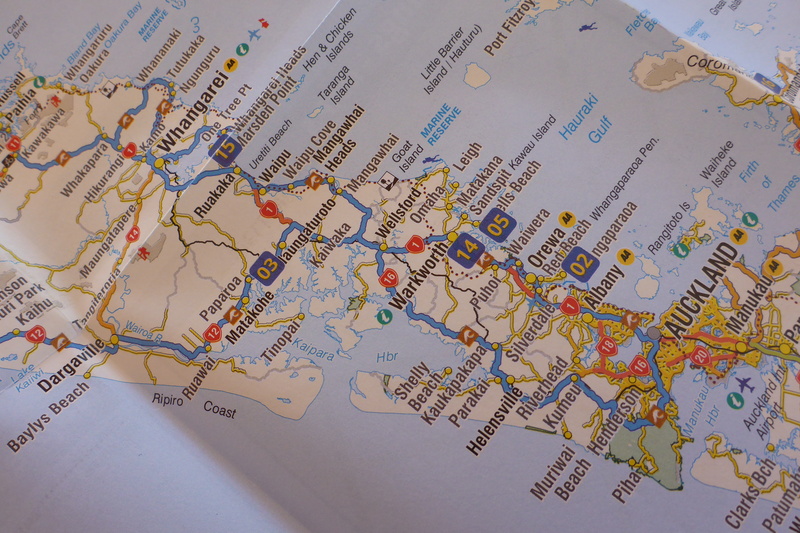 With luggage in car and maps in hand (yes we are still a bit old school and love a good map to guide us) we head north from Auckland making our leisurely way to Paihia our eyes scanning the landscape for places to stop, walks to do and places to eat. You just never know what you’re going to find once you’re on the road as they don’t tell you everything in the tourist brochures, you really do need to get out there and explore. The only problem is if you are like Wayne and I you just keep finding more and more fun, interesting, beautiful and exciting things to see and do! Having driven through Orewa (where Wayne was so disappointed with the tole tunnel. He thought it was going to be a long tunnel but alas it was short and sweet… ) Puhoi, Warkworth and Wellsford, and Mangawhai our first stop ended up being Whangarei. 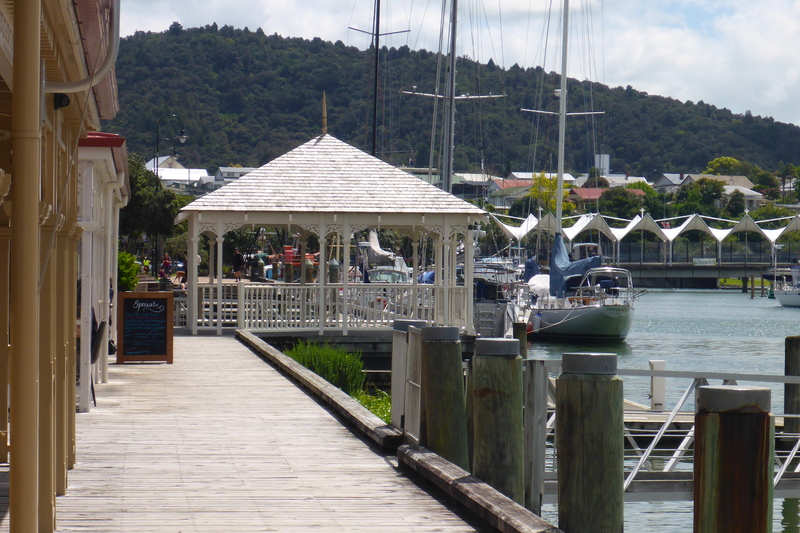 A view along Town Basin, Whangarei. Now there’s a funny story here! We planned to drive straight to Pahia on our first day but with traffic and scenic drives we decided to stay the night in Whangarei. We parked the car, found a tourist information centre and asked about accommodation for the night. The lady who served us was very nice and asked if we were looking for accommodation in ‘Fongaray’ in her very New Zealand accent. Wayne and I must have looked stunned and stupid as we had no idea what she was talking about until it finally dawned on us she was talking about Whangarei. We later learned a little bit about the pronunciation of words and use of vowels in New Zealand so didn’t get caught out quite so much for the rest of the trip! 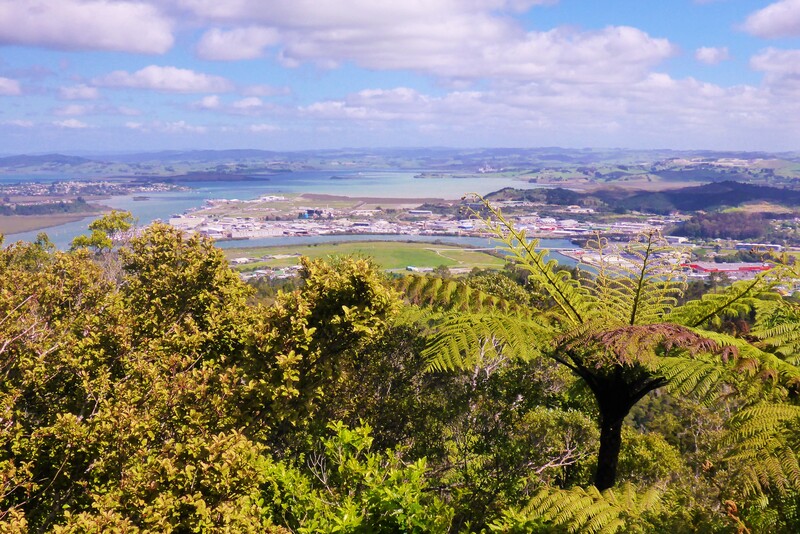 The view over Whangarei from the Mt Parihaka Scenic Reserve. After all that confusion we were booked and settled into a hotel for the night with a million brochures in hand. We decide on Parihaka Scenic Reserve and the summit for our afternoon jaunt. 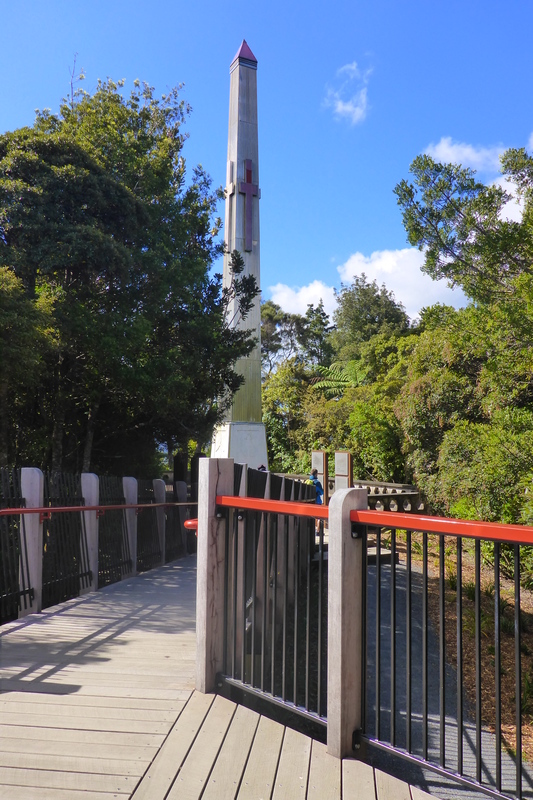 We head up the hill to the lookout which overlooks Whangarei and the Hatea River. With the sun shining over the river and the whitest of clouds hanging over the town you could see forever. This mount we were on, Mt Parihaka, is an eroded volcanic cone which rises 241m above sea level and was once the site of the largest Maori Pa or fortified village in New Zealand . It is also home to the World War II War Memorial commemorating New Zealanders who died in the war. WW II Memorial at Mt Parihaka Scenic Reserve. Back down to earth and having driven for the better part of the day we decided it was time to chill a bit. We wondered around Quayside at the town basin, looked in a few shops and decided where we should have dinner. Town Basin and Quayside sits on the river’s edge, a quaint place with boardwalks, a marina, shops and eateries. Behind we also found the Clapham’s Clock Museum but unfortunately didn’t have enough time to check it out… Maybe next time! But we did see the sun dial which is believed to be the biggest in the Southern Hemisphere with a 22m hand that is rather fascinating and huge! Dinner at The Quay on Quayside was relaxing and enjoyable with great food and good prices. We had a lovely walk from our hotel along the river front and after dinner we were ready for a good sleep to revive us for more exploring in the morning. The Boardwalk at AH Reed Memorial Park. 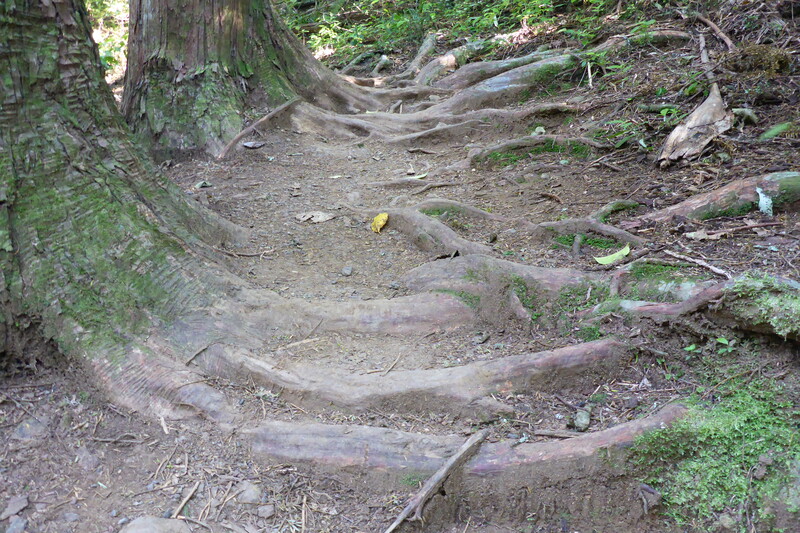 Up early and off to AH Reed Memorial Park for a ‘Walk in the Treetops’ among the kauri trees some up to 500 years old. The park is named after Alfred Hamish Reed who was an author, publisher and lover of long walks, the environment and Kauri trees. 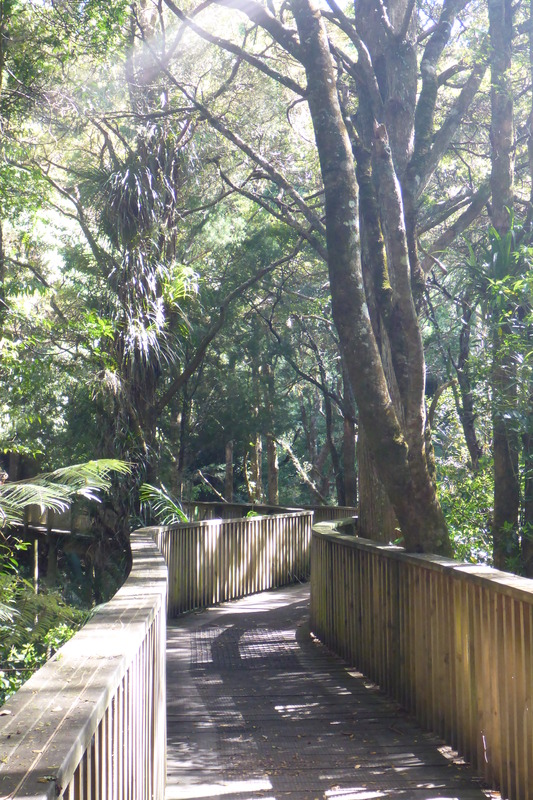 There is an excellent boardwalk and pathway, some littered with roots trying to find their way to who knows where, winding through beautiful greenery, ferns and even the Wai Koromiko Stream which meanders along beside you as you stroll through wonderful natural bushland and of course never ever forget those Kauri trees soring far above your head reaching for the sun! Waikoromiko AH Reed Memorial Park. What a way to spend the morning. Now to top that what would we do? Well you can’t beat a waterfall! Onward and upward to Whangarei Falls. This 26m high waterfall is something not to be missed. As you drive into the carpark it is only a short walk to the top of the falls but there is a longer loop walk to the bottom and back to the top again. 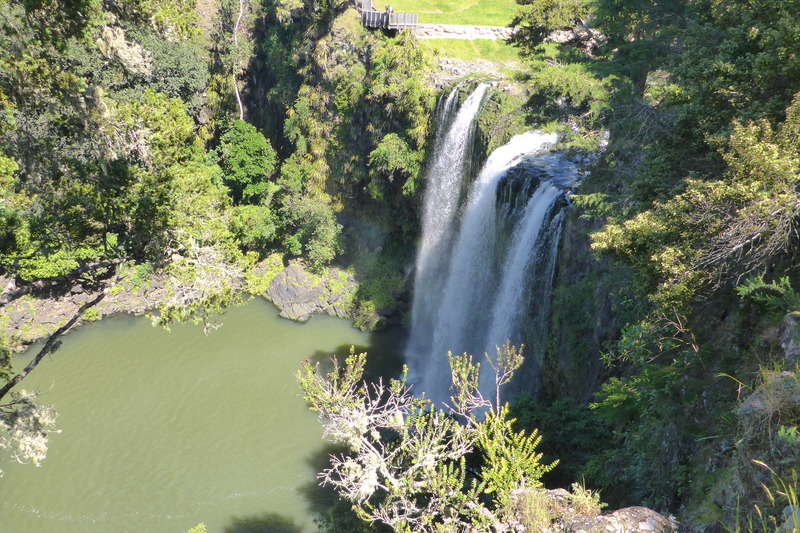 Make sure you do the loop walk, it is a fairly easy walk and is well worth it as you can enjoy the waterfall from different vantage points as well as enjoying a bush walk in surrounds that are synonymous with New Zealand. 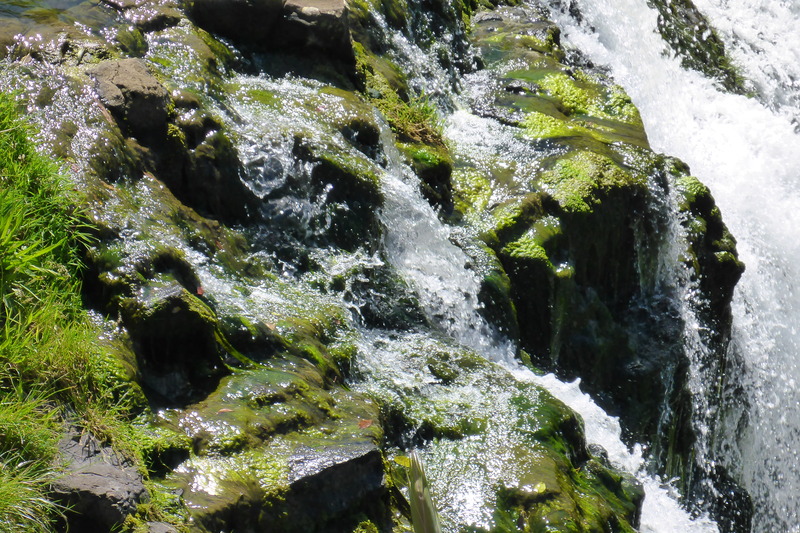 A cascade of water flowing over the mossy green rocks at Whangarei Falls. It is said Whangarei Falls is the most photogenic waterfall in New Zealand and I can see why. The power of the water tumbling over the basalt cliffs, the green mossy rocks shining at the top of the falls, the lush green surrounds making you feel as if you are in the middle of an oasis. It really is a lovely, pretty picture of nature in this wonderful country. The sounds of the white water falling into a simple quiet pool then eventually trickling along, taking it’s time to get to its next destination. I don’t know about you but this is what I love about travel. Nature at its best. Across the pond to Whangarei Falls. 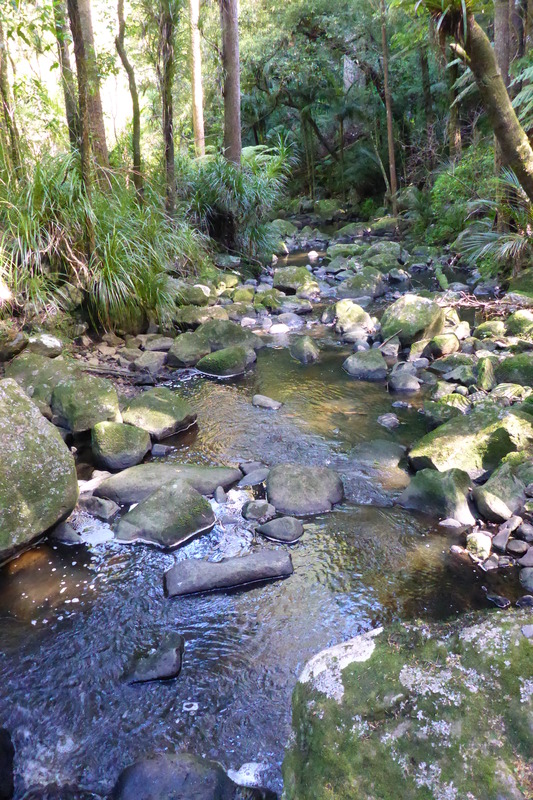 There are numerous walks in and around Whangarei which Wayne and I hope to tackle one day soon. We are awaiting the completion of the new runway at Hobart Airport which, fingers crossed, may take us direct to at least one New Zealand port. What more can I say but we will go back to check out some of the walking tracks, waterfalls and of course food, wine and beer! But for now it is off to Paihia so stay tuned! And if you are interested and want more detail on Whangarei make sure you check out the links below. 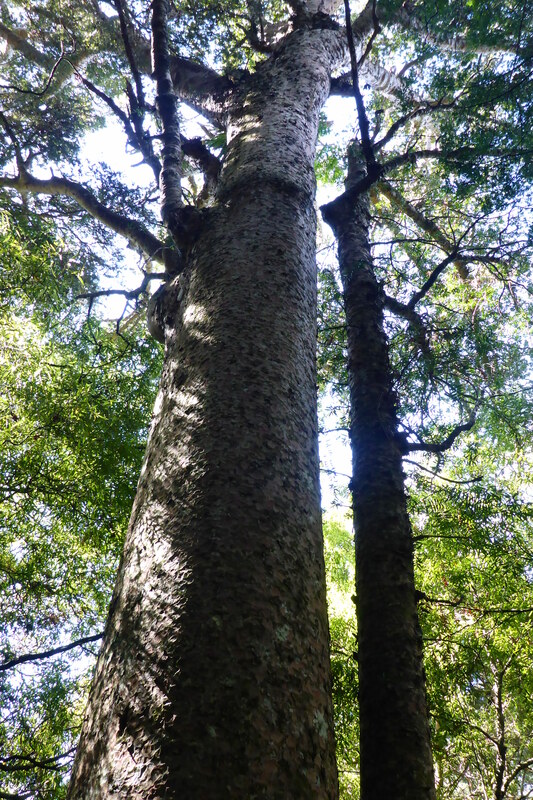 The magnificent Kauri trees in AH Reed Memorial Park. A view from the top! 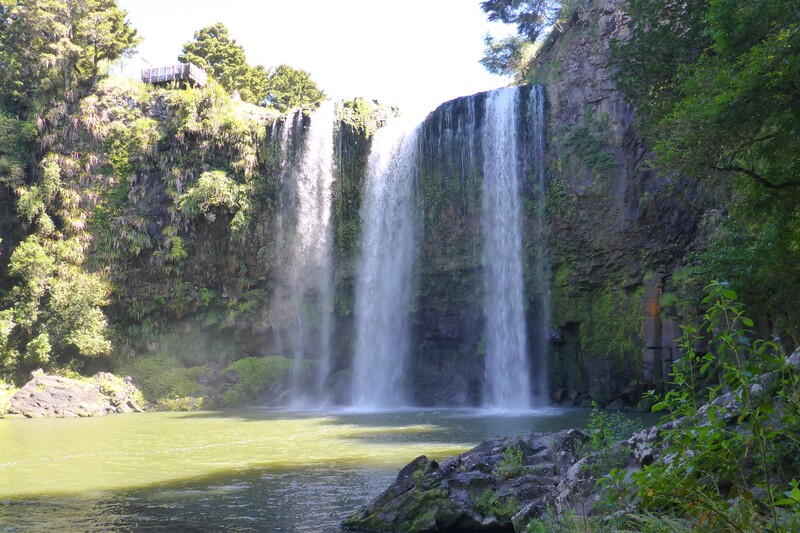 Whangarei Falls. This entry was posted in Home, My travels over the years, Stories of my life, travels and Tasmania and tagged AH Reed Memorial Park, Bushwalks, Holiday, Mt Parihaka, New Zealand, Travel, Waterfalls, Whangarei, Whangarei Falls. Bookmark the permalink.